Zoiks! Online - The Very Best in Stand-Up And Music! : "Stephanie Pickard paid $20 to study under Paul Gilbert." - Part One. "Stephanie Pickard paid $20 to study under Paul Gilbert." - Part One. Recently I was given the opportunity to interview Stephanie Pickard. We came across her in our dealings with the band Cockpit, whom Stephanie recently joined. Stephanie is an amazing guitar player. 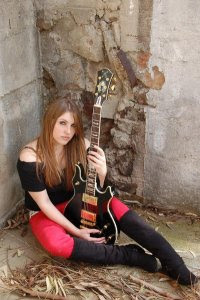 Check her out at http://www.stephaniepickardmusic.com/. The interview ran long so it is going to be a two parter. In this first part Stephanie gets into her early influences and how she paid $20 to study under Paul Gilbert. Q - What age did you start playing guitar? A - I was about 14 or 15 when I started playing. Which actually feels kinda late but when I found guitar I quit everything else I was doing and became very focused, so who knows? Q - You grew up in the age of grunge and nu metal. Neither of those genres are really known for their amazing guitar solos, what made you not only want to learn how to play guitar, but learn as well as you have? A - Well first off thanks! When I started out on guitar it wasn't to become a lead guitar player. I was a freshman in high school and had always loved singing, but never pursued it. But when I was 14 I started writing lyrics and singing them. My parents overheard and my dad suggested I learn a couple of chords so I could turn them into songs. Shortly after that I began taking lessons and fell in love with guitar. All I wanted to do was get better at it and I completely ignored the singing and focused solely on my guitar playing, which now I see as a good thing cause I don't know if I had pursued singing and playing at the same time if I would've spent as much time learning to solo and all the details of guitar. Q - Who were your major influences? A - When I started playing and getting more and more into it they were changing rapidly! For a long time it was Hendrix, Zeppelin and Cream. When I was a senior in high school though I started hanging out with the metal kids a lot and they introduced me to Children of Bodom. Then I got more into other metal bands and all the shred guitar players. Q - Looking at your Myspace page I see that Paul Gilbert gave you a positive review. What's it like to know that a living legend like Paul Gilbert has listened to your playing and liked it? A - I hope it's OK to have that up there - he said it to me in person, but I didn't ask him if I could put it up (laughs), so sorry Paul! Yeah it was definitely surreal, I was lucky enough to get a few lessons with him when I was going to the Musicians Institute. Everyone was actually supposed to just get one lesson, but I paid another student twenty bucks so I could have theirs too (laughs)! He started off all the lessons with us jamming in no specific key while he scratched the guitar to keep tempo and just kind of let us go, commented on our playing and gave suggestions. My private instructor at the Musicians Institute, Ernesto Homeyer, really pushed me to work on my vibrato. He said people would assume I would have a bad vibrato because a lot of guys tend to think of it as a masculine thing. I spent a lot of time working on my vibrato and for Paul to notice it was really cool, especially since he is one of my favorite guitar players! Q - I enjoyed Cockpit's EP "Mission to Rock." I noticed on your Twitter account you said you were in Cockpit. Does that mean you're in the band? A - I believe I am! Q - How did that come to be? A - The girls were hopping on the last leg of the Supersuckers tour in November and needed someone to fill in on lead guitar. I had actually met and played with them about three years before, filling in for a show at the Viper Room. At the time I wasn't ready to join the band, I was still in school and figuring out what I wanted to do, etc. Luckily they thought of me and I got a call from Linda Lou asking if I was available. The timing was perfect and within a week we were rehearsing. In a month we were on the road. After the shows were done, the girls told me they didn't want to lose me and added me in the band. We've been playing together since and it's worked out great. Q - Now that you're with Cockpit, will that be your full time focus or will you still be working on solo music as well? A - I have definitely put Cockpit first. However, I love writing music and my solo stuff is so different from what we do that I actually write completely different parts for each project anyway. Before Cockpit, my music was my only project so now instead of ignoring it completely I'd rather just work twice as hard. Joining a band is a serious commitment though so I plan on not letting my project interfere with Cockpit at all. It's more of something I do for myself right now.